The Home 18kW Regular Gas Boiler is a highly reliable unit that comes with several benefits to help it meet the heating and hot water demands of your home. This highly reliable boiler features an efficiency rating of 89.3% (SAP) and has an ErP rating of A, with 93% ErP efficiency. With an output rating of 18 kW, this makes the boiler perfectly suitable for smaller homes that don’t have as much demand for heating and hot water. Also available in a range of other outputs from 12-30kW, this highly reliable boiler is perfectly suited for to the heating demands of many homes. 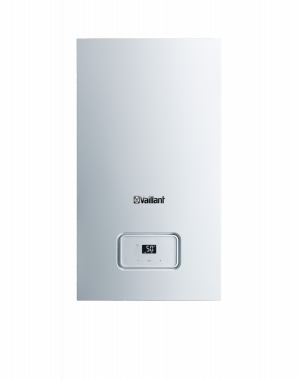 Designed and manufactured by Vaillant, this Regular gas boiler is wall mounted to leave you with valuable floor space. Thanks to its compact dimensions of 600mmx375mmx280mm (HxWxD) this unit continues to save space in your home. It can also be placed in a cupboard to keep it out of sight and out of mind too. Thanks to its compact size and low weight, you’ll be saving money on the installation too. Other features of this unit include a 4% higher SAP Performance, a fully modulating low NOx burner and two-way condensate trap for simplicity of commissioning, a fully-modulating high efficiency grundfos pump, and it’s fully compatible with all current Vaillant controls. The unit also comes with patented 4 sided cooling, that reduces stress on the aluminum heat exchanger making the boiler more reliable and lowers the cost of the ownership of this boiler. As a Regular boiler it incorporates a boiler, extended controls, a hot water cylinder, which is often fed by a cold water storage cistern located in the loft, and a feed and expansion cistern, also located in the loft. Due to all of this, it’s not always suitable for smaller homes where space is limited. Featuring a 2 year warranty, this boiler will give you the peace of mind you need when choosing a new boiler.